Dang Le Nguyen Vu (R), chairman of Trung Nguyen Group, and his ex-wife Le Hoang Diep Thao are seen in this collage of Tuoi Tre photos. 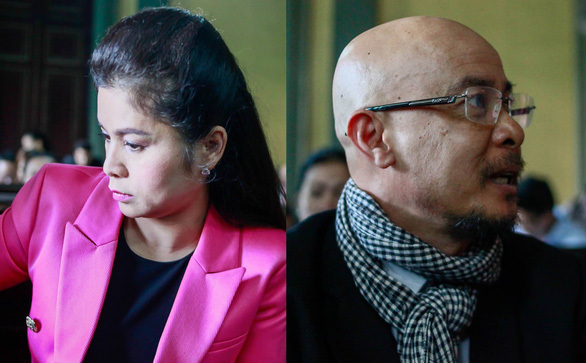 The chairman of Vietnamese coffee giant Trung Nguyen Group and his ex-wife, who received court approval last month to be legally parted, have both appealed a court verdict dictating the terms of their divorce. Dang Le Nguyen Vu, founder and chairman of Trung Nguyen, demanded a larger share of the former couple’s disputed assets while his ex-wife, Le Hoang Diep Thao, hopes to overturn the divorce. Vu, 48, was handed 60 percent of the couple’s disputed assets, valued at US$354 million, in addition to the entirety of their combined shares in Trung Nguyen, worth $246.8 million, by a Ho Chi Minh City court on March 27, putting an end to a three-year legal battle. The court’s ruling also stipulated that Thao would take custody of the couple’s four children and the remaining 40 percent of their assets. Vu was asked to pay Thao the cash value of her shares which he will be taking over, as well as $431,000 in annual child support. Both parties have filed appeals against the court’s decision, said the People’s Court of Ho Chi Minh City on Tuesday, two weeks after it issued the original ruling. Thao filed her appeal against the entire verdict on April 5, asking to overturn the divorce and be reunited with Vu. She disagreed with the splitting of their assets to the ratio of 6:4 in favor of Vu and the court’s decision to give her ex-husband management rights, through the share acquisition, over Trung Nguyen. Vu filed an appeal against part of the verdict on Wednesday, repeating his original demand for 70 percent of the couple's assets instead of 60. Vu and Thao got married in 1998, two years after they co-founded Trung Nguyen, and lived together until disagreements between them led the woman to file for divorce in 2015. Trung Nguyen Group is one of Vietnam’s largest and most well-known coffee producers, chalking up revenues of VND3.95 trillion ($170.5 million) in 2017.